​e like me ke kanaka i noho kūʻokoʻa no ke aloha i kona ʻāina. through aloha for their ʻāina. ʻO ka Lā Kūʻoʻkoʻa kēia ma Hawaiʻi nei! A eia kekahi mau wahi manaʻo no ka noho kūʻokoʻa ʻana o kānaka no ke aloha i ko kākou ʻāina. Today is Lā Kūʻokoʻa, Independence Day, here in Hawaiʻi! And here are some thoughts to be shared and discussed about living independence through the aloha we have for our ʻāina. Originally published in Mana Magazine, Oct./Nov. 2014. E ka lāhui aloha ʻāina, mai Hawaiʻinuikuauli a ka mole ʻolu o Lehua, ke aloha nui iā ʻoukou. Eia nō he kupa o ka ʻāina kaulana i ke ala ʻūlili ke hoʻolono aku nei i ka leo o ke kai o Koholālele e wawā aku nei mai kahi kihi a kahi kihi o ka ʻāina kihi loa, mai ka piko o Wākea a ke kumu pali lele koaʻe. Ua ao, ua mālamalama a lohe ʻia mai ka ʻolēhala o ka leo hala ʻole o nā kai ʻewalu. ʻO kēia leo heahea, ‘o ka lāhui ʻōiwi nō ia, a ua kūpaʻa nō hoʻi i ke aloha no ko kākou ʻāina kulāiwi. Ea mai ko Hawaiʻinuiākea mai ka pō mai, puka mai i ke ao, a i lāhui aloha ʻāina kākou mai ka wā kahiko a hiki i ke au hou e neʻe nei i ko kākou kuamoʻo i hoʻopaʻa ʻia i ko kākou ʻāina. Ua nohopaʻa ua kuamoʻo aloha ʻāina nei i loko o kākou, a ua hoʻohiki paʻa ʻia i nā ʻōlelo koʻikoʻi a kekahi aloha ʻāina ʻoiaʻiʻo o Hawaiʻi, a Joseph Nāwahī, ʻo ia hoʻi “ʻAʻole mea ʻoi aku o ka waiwai e like me ke kanaka i noho kūʻokoʻa no ke aloha i kona ʻāina” (Ke Aloha Aina, July 4, 1896). Paʻa kēia ʻano o ka noho ʻana no ke aloha ʻāina ma ka moʻolelo no ʻUmi-a-Līloa, ke aliʻi kaulana o Hāmākua, ma Hawaiʻi. I ka lilo ʻana o ka ʻāina i ko ʻUmi kuaʻana, iā Hakau, a hoʻokae wale maila ʻo Hakau i kona kaikaina, hoʻi hou akula ʻo Umi mai Waipiʻo aku i ke kuamoʻo i ka ʻāina makuahine, a ua noho kūʻokoʻa ʻo ia no ke aloha i kona ʻāina. Iā ʻUmi nō e noho ʻilihune ana i ia manawa, ua lālau ʻia, pūʻili a paʻa ke aloha i ka ʻāina a lawelawe pono akula kona mau lima i ka mahiʻai a me ka lawaiʻa. Pēlā i paʻa ai ka ʻāina iā ʻUmi a kuapapa nui ke aupuni o Hawaiʻi i nei aliʻi mahiʻai a kapa ʻia he puʻipuʻi a ka lawaiʻa hoʻi. Hoʻokahua ka ʻāina, hānau ke kanaka. Hoʻokahua ke kanaka, hānau ke aliʻi. ʻO ke aloha ʻāina ke kahua, a kūkulu pono ʻia ka hālau aupuni. A pau aʻela ka hale o ke aliʻi paʻa ʻole i ke aloha no kona ʻāina. This way of living for aloha ʻāina is exemplified in the moʻolelo of ʻUmi-a-Līloa, the famous chief of Hāmākua, Hawaiʻi. When the lands of Hawaiʻi came under the control of ʻUmi’s older brother, Hakau, and Hakau continuously mistreated his younger brother with contempt, ʻUmi returned from Waipiʻo to the homelands of his mother, and there he lived independently for the aloha of his ʻāina. 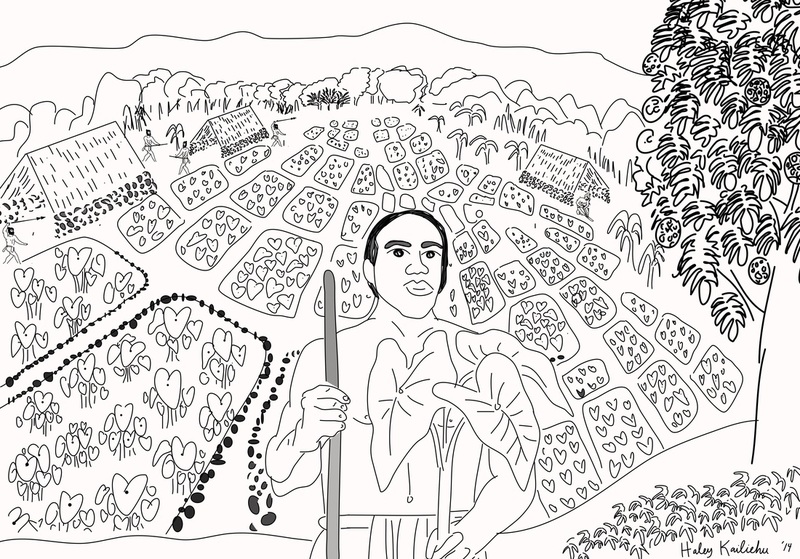 While ʻUmi lived in destitution during that time, he firmly grasped and held tightly to the aloha he had for the ʻāina, and with his own hands took on the work of farming and fishing. That is how the ʻāina was secured by ʻUmi, and the kingdom became unified by this farmer chief, who was also called a stalwart fisherman. The ʻāina creates the foundation upon which the people are born, and the people create the foundation upon which the chief is born. Aloha ʻāina is the foundation upon which a house of government can be properly built. And the house of the chief who is not firm in aloha for their ʻāina will be easily destroyed. “Ka Moolelo Hawaii,” Ke Au Okoa, Now. 3, 1870, na Samuel M. Kamakau. An English translation is provided here in Ruling Chiefs of Hawaiʻi. “Ka Moolelo no Umi: Kekahi Alii Kaulana o ko Hawaii Nei Paeaina,” na Abramham Fornander. "A Time to Remember." Ka Hoku o ka Pakipika, Buke I, Helu 10, Aoao 2. Novemaba 28, 1861. "The 28th of November." Elele Hawaii, Buke 9, Pepa 19, Aoao 75. Dekemaba 1, 1854. Every place has a name, and every name has a story. 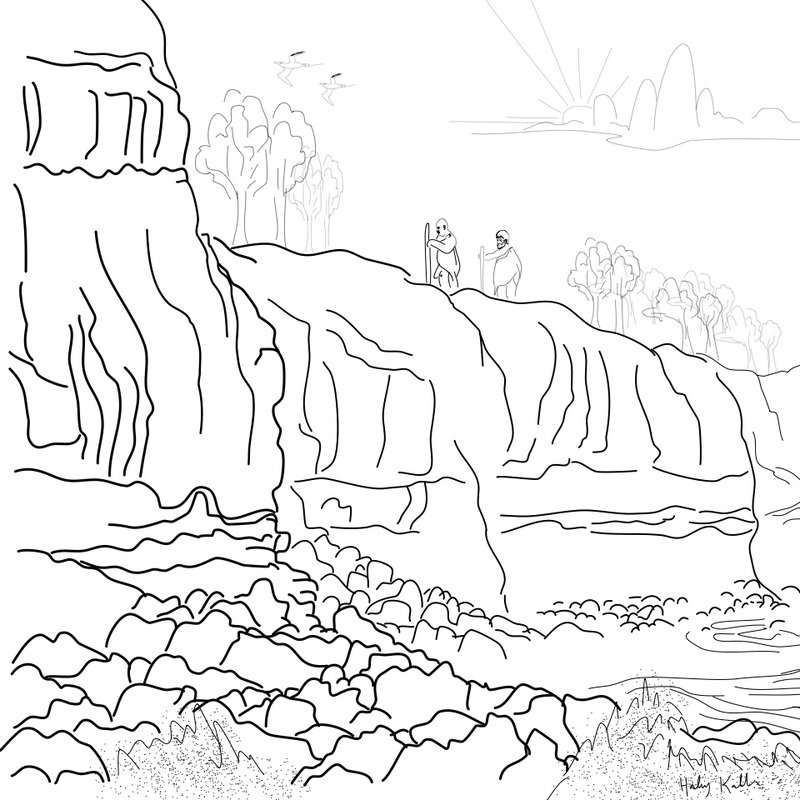 ​Here is one short story (of many untold) for a place whose name is familiar to many, but whose history is known by few. Here is a story of a quiet, old plantation town in Hāmākua. ​Whether you are a diehard Tiger or an occasional passerby, and definitely if you’re a born-and-raised kamaʻāina, there’s a good chance that Paʻauilo has influenced your life in some way. No joke. “That small country town? !” You might be thinking to yourself. Yeah. It doesn’t look like much to most, but I can assure you that if you are Kanaka and/or a kamaʻāina of Hawaiʻi Island, this place—now recognized as a “town,” whose name is derived from the ahupuaʻa in which it is located—has played some sort of role in your past, present (and if not, then future) experience of Hawaiʻi. So if you’re not from Paʻauilo, or Hāmākua, then let’s begin at the most basic, surface level: Earl’s. Chances are, if you’ve driven through Hāmākua on your way to Hilo or Waimea, you’ve stopped at Paʻauilo Store and bought a bento roll made by Earl’s. If you haven’t, pua ting you. Well maybe you didn’t happen to have cash on you when you stopped, so you just took the opportunity to use the porta-potty outside the store. 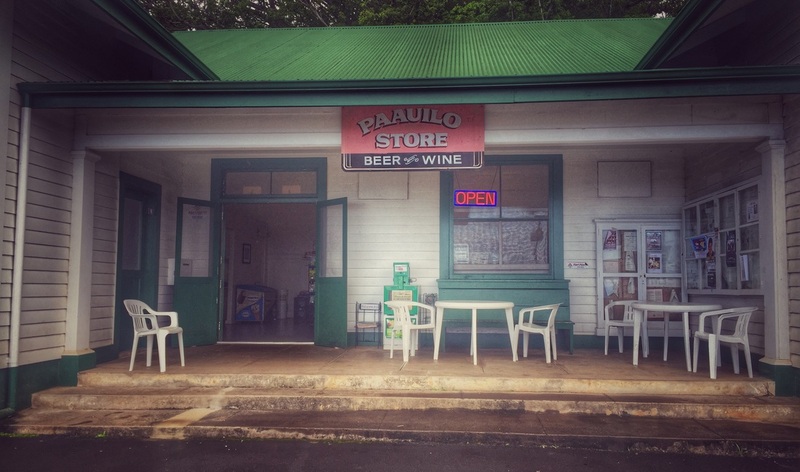 Either way, Paʻauilo is generally a midway stop for commuters, cruising locals, or tourists, and a central hub for kamaʻāina of the area. It’s about 40 minutes from Hilo, and about 25 minutes from Waimea. So if nothing else, at the very very least, your belly and bladder can probably thank Paʻauilo for tiding you over on your long journeys. Okay, let’s kick it up a notch. Up until the early 1990s, Paʻauilo was smack-dab right in the middle of the island’s century-old sugar industry. Paʻauilo was a bustling plantation town made up of various “camps”—Old Camp, New Camp, Japanese Camp, Haole Camp, Nakalei—a school (home of the Paʻauilo Tigers), a store, a post office, a few churches, a ball park, and a couple generations of kamaʻāina, most of whom led humble lives shaped by sugar or cattle. A handful of my ancestors experienced Paʻauilo in this way, and developed a deep love and respect for this ʻāina, like many others. Those memories, however, remain beyond the realm of what my eyes have seen, and would best be shared by those whose eyes have. So let’s continue on this path, and talk a little more about what is unseen by most about this place. 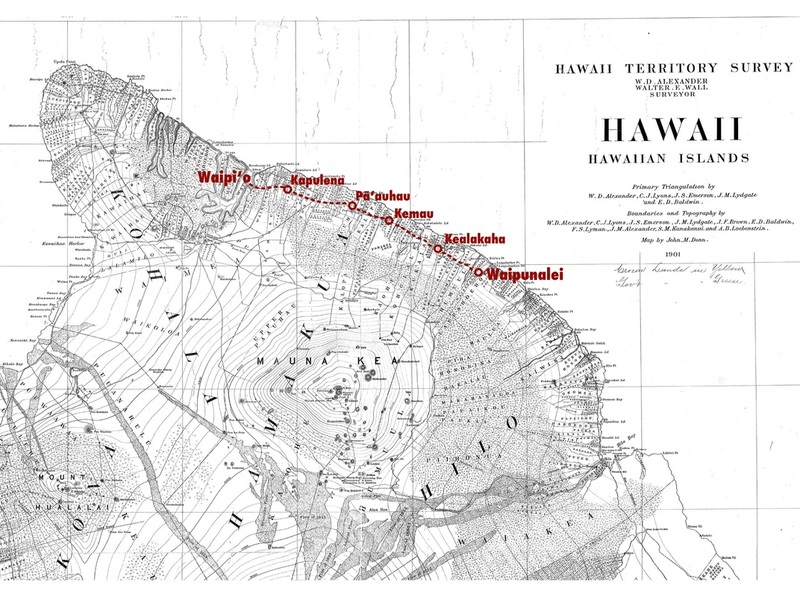 1881 Map of the Ahupuaʻa of Paʻauilo (Reg. Map 855) Red dot indicates where Paʻauilo Store is today. ​Paʻauilo, called “Pauilo,” or something close to “Pawilo” by most people today, is one of over 130 ahupuaʻa (ancestral land divisions) located in the district of Hāmākua. In the early 1800s, this ahupuaʻa was the kuleana of an aliʻi wahine by the name of Mikahela Kekauonohi. She was a high-ranking chiefly grandchild of Kamehameha I and kiaʻāina (governor) of Kauaʻi. As part of her "payment" to the government for lands received during the Mahele of 1848, Kekauonohi relinquished Paʻauilo to Kamehameha III (Kauikeaouli), who later set the ahupuaʻa aside as part of the Government Lands of the Kingdom. Not long after, George S. Kenway and Robert Robinson, two haole men, purchased most of the ʻāina in this ahupuaʻa from the Kingdom government as Royal Patent Grants 2221, 2222, and 663—“Koe naʻe ke kuleana o nā kānaka”—"Subject to the rights of native tenants." These land sales would eventually plow the way for the establishment of large-scale sugar in the area. Prior to the Mahele, Paʻauilo, like other relatively small ahupuaʻa in Hāmākua Hikina (east Hāmākua), was likely home to about 150-200 Kānaka. 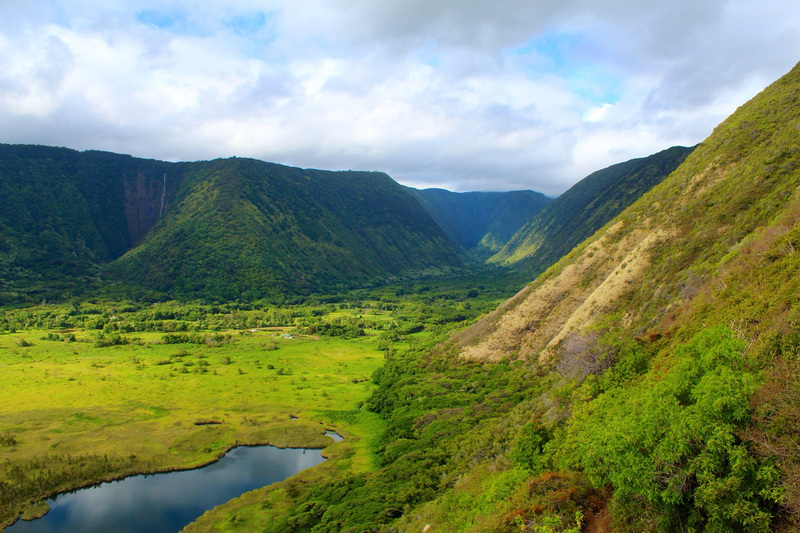 Early European explorers and American missionaries described the area as fertile and highly cultivated, dissected by the multitude of streams that, now dry, once cascaded off the edge of Hāmākua’s sheer cliffs. One of these streams, Waipunalau, which forms the Kohala-side boundary of Paʻauilo (adjoining the ahupuaʻa of Paukiʻi), is fed by a spring named Waihalulu. Once favored by the kamaʻāina of Hāmākua Hikina for its “wai māpuna ʻono huʻihuʻi” (deliciously cold fresh spring water), Waihalulu was visited by Kamehameha I and his koa when they retired from the battle of Koapāpaʻa. Koapāpaʻa, located in the ahupuaʻa of Kūkaʻiau (just over a mile from Paʻauilo) was the site of the last battle fought by Kamehameha on Hawaiʻi Island in his campaign of unification. The 1791 battle began with Kamehameha holding a ceremony at Manini heiau in Koholālele, and ended with Keōua-kūʻahuʻula, the reigning chief of Kaʻū, seeking refuge under a large stone in Kainehe, which later came to bear his name: Pōhaku o Keōua. The battle proved to be a decisive victory for Kamehameha, as he soon gained control over the entire island. Nā pali loa o Hāmākua. Photo by Author, 2015. But what was Kamehameha doing in Paʻauilo? Kamehameha was not the chief of Hāmākua. Kamehameha was from Kohala, and his primary alliances were formed with other Kohala and Kona chiefs. The aliʻi ʻai moku (district chiefs) of Hāmākua at the time that Kamehameha rose to power were Kānekoa and Kahaʻi, two chiefly brothers and uncles of Kamehameha. Both Kānekoa and Kahaʻi had actually fought against Kamehameha in the famous battle of Mokuʻōhai (in 1782, near Keʻei, Kona), defending Kīwalaʻō and his kālaiʻāina (chiefly redistribution of ʻāina). After Mokuʻōhai, Hāmākua came under the control of Keawemauhili, the highest ranking chief of the ʻĪ line alive at the time. Under his protection, Kānekoa and Kahaʻi remained until a disagreement forced them to flee the Hilo chief to go live under the Kaʻū chief, Keōua-kūʻahuʻula. 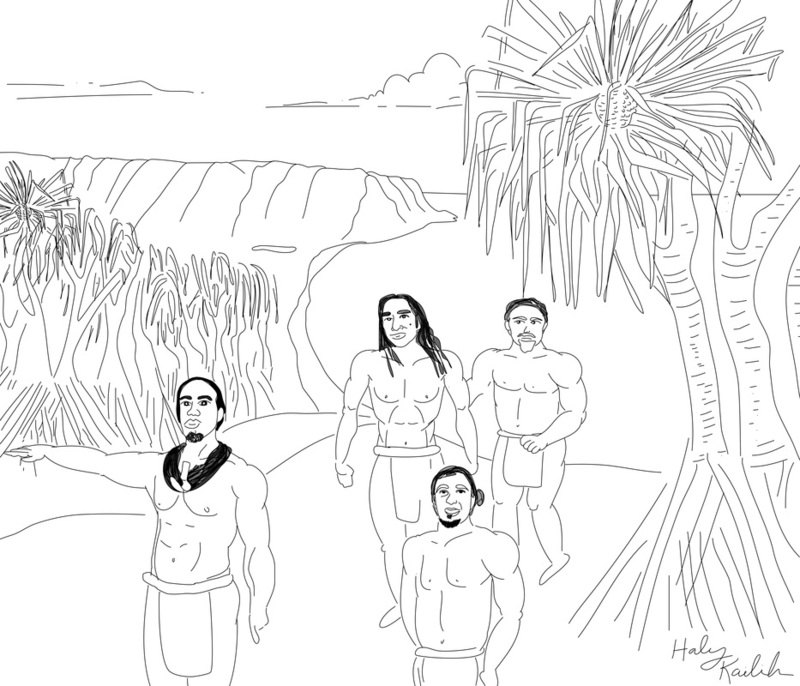 The Hāmākua chiefs must have been quite independent in their thoughts and actions, because not long after settling in with Keōua, another fight ensued between the chiefs, leaving Kānekoa dead and his brother grieving. During his mourning, Kahaʻi sought refuge in his nephew, Kamehameha. Kamehameha showed aloha for his uncles, recalling days when he was carried on their backs, and vowed to put an end to the Hilo and Kaʻū chiefs. It was these events, among a few others, that eventually brought the decisive battle to Hāmākua Hikina. It should be noted, however, that in his flight of defeat, Keōua was hidden and protected in Kainehe, by a kāhuna of the area, presumably with the support of the people of the area. Keōua represented the last of the ruling aliʻi of the powerful ʻĪ line that had kuleana over east Hawaiʻi (from Hāmākua to Kaʻū) since the time of ʻĪ, the great-grandson of the famous Umi-a-Liloa. The people of east Hawaiʻi were fiercely loyal to their chiefs of the house of ʻĪ, and those of the west held tightly to the Keawe clan. This battle between lineages was not a new one. It stemmed back to the generations that followed Umi’s unification of the island (about 16-17 generations before present). It seems only fitting, then, that the last battle in Kamehameha’s unification of our island would take place in the ʻāina hānau (birthplace) of ʻUmi, the great unifying ancestor from which both Keōua and Kamehameha descended. 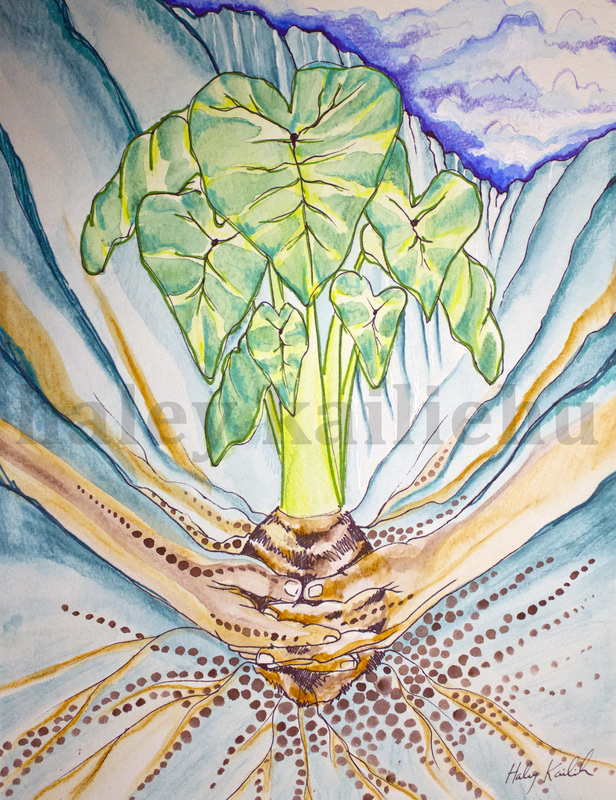 Hāmākua, then, was the "elder stalk" that held the ʻohana of moku together. Fast forward now a few generations to another time of vast political upheaval. Following the unlawful overthrow of the beloved reigning monarch of the Hawaiian Kingdom, Liliʻuokalani, in Honolulu, and the onset of the United States’ prolonged occupation of our islands, Kānaka and other loyal subjects of the Kingdom fought fiercely for the restoration of our country’s independence. In addition to the organizing of the Hui Aloha ʻĀina and Hui Kālaiʻāina that effectively defeated an impending treaty of annexation forced upon Hawaiʻi by those with imperialistic interests, Kānaka leaders in the struggle for independence from both Hui also formed the Independent Home Rule Party, nā Home Rula Kūʻokoʻa. Founded in 1900 by poʻe aloha ʻāina ʻoiaʻiʻo (people truly loyal to this ʻāina), Robert Wilcox, David Kalauokalani, and James Kaulia, the Independent Home Rule Party, as their name suggests, stood for the restored independence of the Hawaiian Kingdom. And their battlecry was one rooted in unification. As part of their campaign of unification, the party published two newspapers, first Ka Naʻi Aupuni (The Conqueror), and then, Kuokoa Home Rula (Independent Home Rule). Ka Naʻi Aupuni made clear whose responsibility it was to remedy the dire situation that the lāhui had found itself in: “Na Hawaii e Hooponopono ia Hawaii,” It is Hawaiʻi / Hawaiians that will bring pono to Hawaiʻi once again. The second paper, Kuokoa Home Rula, went further to remind us of the means by which we could fulfill this responsibility. “Ma ka Lokahi ka Lahui e Loaa ai ka Ikaika.” It is in Unity that the Lāhui obtains its Strength. Without actively enacting the “hui” in "lāhui," uniting together, we would cease to exist as a lāhui, a nation. I ku mau mau! I ku huluhulu! I ka lanawao!! E pane mai like oukou: I ku wa! I kahea aku au ia oukou: I ku lanawao! I ku mau mau—e! Ko! And you all respond together: I ku wa! I call out to you all: I ku lanawao! from the Hawaiian Gazette, Sept. 20, 1912. Now a commonly heard chant at Hawaiian gatherings of all sorts, “I Kū Mau Mau” was primarily invoked to inspire collective action when pulling a large felled tree down from the uplands (such as those on the slopes of Maunakea in Hāmākua), to be carved as a canoe or heiau image. Kahiliaulani’s invocation of it in his speech may be the first recorded usage of it in the context of contemporary Hawaiian politics. Though never successful in his campaigns to become a delegate to the U.S. congress, Kahiliaulani remained a fervently loyal Home Rula and Aloha ʻĀina, encouraging our people to “pull together” until the end. In fact, in a 1912 hearing regarding the conditions of Native Hawaiians, Kahiliaulani was quoted as having testified before then U.S. Secretary of the Department of Interior, Walter L. Fisher, that the U.S. should “give all the lands back to the Hawaiians.” According to the reporter from the Pacific Commercial Advertiser, many of those present in the room chuckled at what seemed to be an unrealistic proposition. But Kahiliaulani did not waver in his conviction. Not only should all the lands be returned to Hawaiians, he insisted, but the government should also appropriate sufficient funds to support Hawaiians living and remaining on those lands. Imagine that. And just a little over a hundred years later, the U.S. Dept. of Interior is still getting an earful from the brilliant aloha ʻāina of this place. Surely Kahiliaulani is not the only historical figure from this unassuming place who deserves our praise and remembrance. He is but one of many who has been selectively honored in this moʻolelo—a moʻolelo which serves, really, to honor this place. After all, they are one and the same. And as is the responsibility of any storyteller, I will now conclude this moʻolelo where it began: in a quiet, old plantation town in Hāmākua. So the next time you pass by or stop at Paʻauilo Store, look ma kai across the street, and imagine Kahiliaulani once living there. And then look towards Hilo, and imagine the abundant days of Umi-a-Liloa’s youth or the awesome scene of over 30,000 koa converging in battle at Koapāpaʻa. Then look ma uka, and see the sacred summit of Mauna a Wākea, the highest peak in all of Oceania. Then look towards Kohala, towards the sacred valleys of Waipiʻo and Waimanu where generations of our most powerful chiefs once ruled. And remember why this place is called Hāmākua, "the parent stalk" of this island. And back here in the middle of it all you will find yourself, in a quiet, old plantation town, in Paʻauilo. 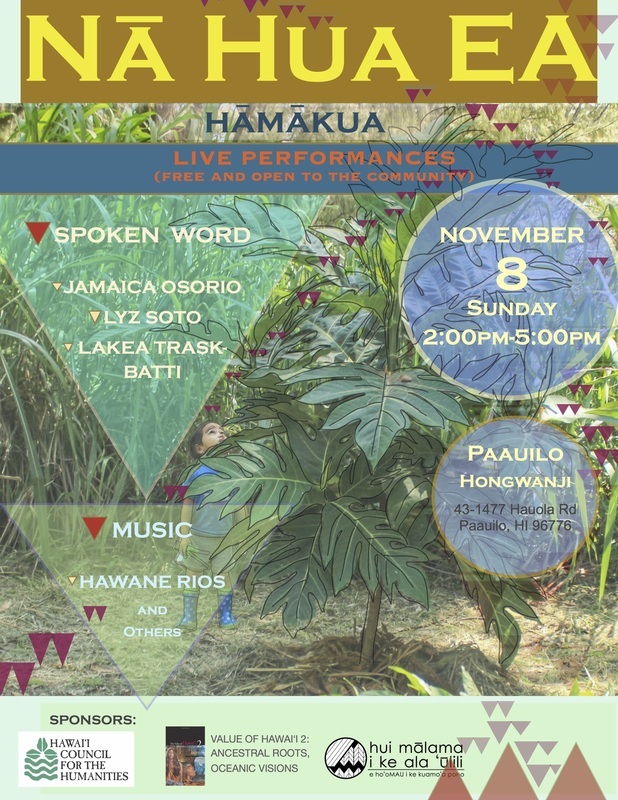 In the same spirit of unification, Hui Mālama i ke Ala ʻŪlili invites all in our community to join us for Nā Hua Ea on November 8, 2015 in Paʻauilo at the Paʻauilo Hongwanji. 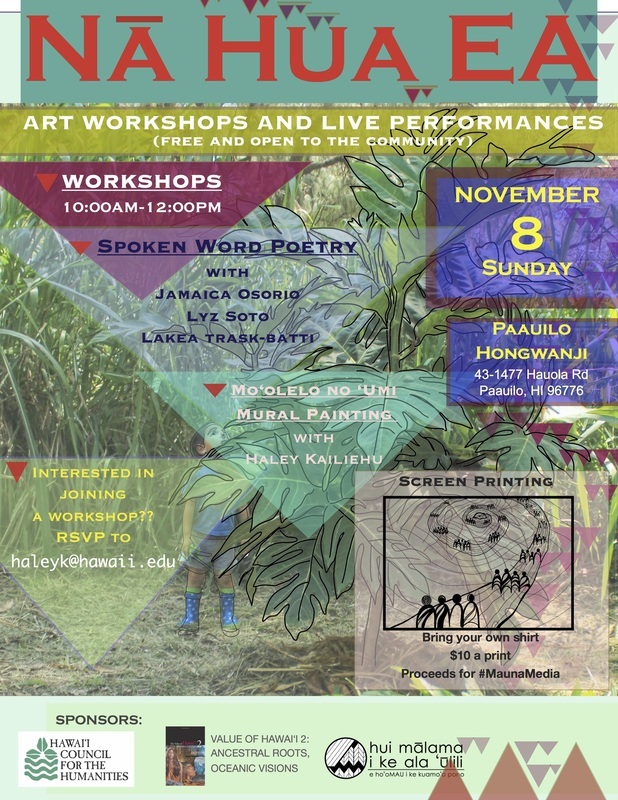 Nā Hua Ea is an art and poetry event collaboration between the editors of The Value of Hawaii 2, the Hawaii Council for the Humanities, and huiMAU, to bring together our community to create and share art and poetry that expresses our vision of Ea, genuine life, sovereignty, and well being. The day will begin with poetry and art workshops, open to the community, and culminates with an open mic performance. Please feel free to share the event flyers below. Mahalo! Ua mahuka malu ʻo ʻUmi mā i ka nahelehele i uka o Hāmākua. Illustration by Haley Kailiehu, 2014. No ka heʻe malu ʻana ʻo Umi mā mai o Hakau aku. I ka make ana o Liloa, noho aku o Umi malalo o Hakau, a nui no hoi ko Hakau huhu mai ia Umi, a nui no ka hokae mai ia Umi. I ko Umi wa e heenalu ai i ko Hakau papa, i mai o Hakau ia Umi, "Mai hee oe i ko'u papa; no ka mea, he makuahine noa wale no kou ma Hamakua, he kapu ko'u papa, he alii au." I ko Umi hume ana i ko Hakau malo hokae mai o Hakau me ka i aku ia Umi, "Mai hume oe i kuu malo, he alii au; he makuahine kauwa kou no Hamakua." Pela no o Hakau i hoino ai ia Umi, ka hookuke maoli; alaila, hee malu o Umi mai o Hakau aku. Eia ko Umi mau hoa hele, o Omaokamau, o Piimaiwaa, o laua kona mau hoa hele mua mai Hamakua mai a Waipio. I ko lakou hoi hou ana i Hamakua, mai Waipio aku, ma ko lakou ala i hele mua mai ai i ko lakou pii ana'ku ma Koaekea, hiki lakou ma Kukuihaele, alaila, loaa ia lakou o Koi, alaila, hele oia me Umi. I ko lakou hele ana'ku a hiki lakou i Kealahaka, oia ko Umi wahi i hanau ai, aole lakou i kipa i kona makuahine; no ka mea, ua manao lakou e hele kuewa wale aku. Upon the death of Līloa, ʻUmi lived under Hakau. Great was Hakau's anger towards ʻUmi, as were his attempts to completely erase ʻUmi from existence. When ʻUmi went surfing on Hakau's board, Hakau said to ʻUmi, "Do not surf on my board, because you have a commoner mother in Hāmākua, and my board is kapu. I am an aliʻi." When ʻUmi girded Hakau's malo, Hakau seized ʻUmi and told him, "Do not gird my malo. I am an aliʻi. You have a lowly servant mother from Hāmākua." That is how Hakau mistreated ʻUmi, with the true intention of driving him away. Therefore, ʻUmi sought protection in escaping Hakau. ʻUmi's traveling companions were ʻŌmaʻokāmau and Piʻimaiwaʻa, those who had first traveled with him from Hāmākua to Waipiʻo. In their return to Hāmākua from Waipiʻo, along the path they traveled in their ascent of Koaʻekea, they arrived at Kukuihaele. It is there that they found Kōī, and he went along with ʻUmi. 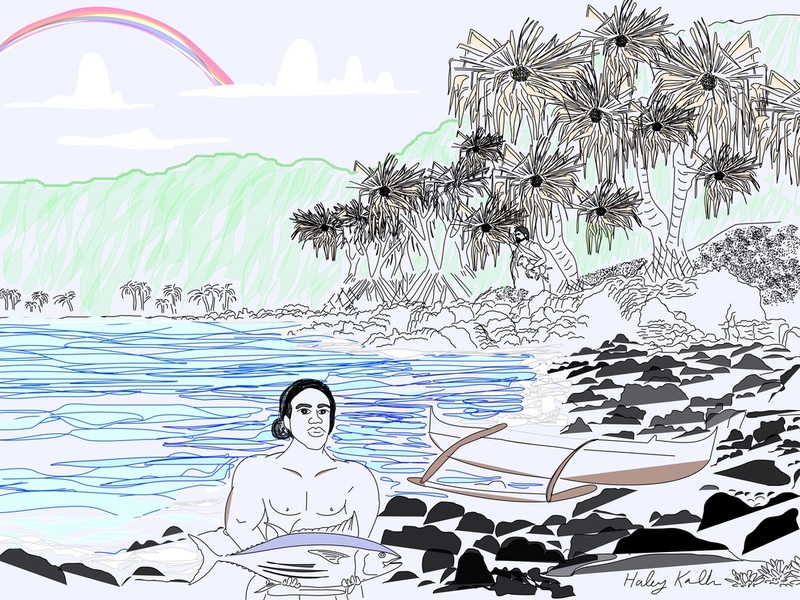 As they traveled back towards Kealakaha, the place where ʻUmi was born, they did not stop to visit his mother, for it was their thought to simply wander for a while. Nolaila, ua mahuka o Umi a Liloa me kana mau keiki hookama, a no ka makau no hoi kekahi o Umi o make i ka pepehiia e Hakau, nolaila, ua mahuka malu o Umi ma, ma ka nahelehele mauka o Hamakua, a o loaa hoi kekahi ke hele ma ke alanui, a ma Puuaahuku [Puaahuku] ko lakou mahuka ana, a komo i ka lae laau, a o ke akamai o Piimaiwaa i ka uhai manu o ka nahelehele, a ua loaa no hoi ka ia a me ka lakou ai, a hiki o Umi ma i uka o Laumaia Kemilia, o Laumaia Kenahae, a noho lakou nei ilaila, alaila, hoouna mai la o Umi ia Piimaiwaa e hele mai e hai ia Akahiakuleana, aia ko lakou wahi i noho ai i uka o Humuula, aohe e hiki ia lakou ke hoi mai e noho pu lakou me na makua o Umi a Liloa, aka, ua olelo o Akahiakuleana, aole pono e hoi mai e noho pu, ua hiki aku ka imi a na Luna o Hakau ilaila. Olelo aku o Akahiakuleana, aole he pono ka noho ana ma na palena o Hamakua, e pono ke hele ma na palena o Hilo, no ka mea, ua kukaawale ka moku o Hilo ia Kulukulua, aole he mana o Hakau ma Hilo. A lohe o Umi ma i keia mau olelo a Piimaiwaa mai ka makuahine, ua hele aku lakou a noho ma na palena o Hilo e kokoke mai ana i ka palena o Hamakua, o na Waipunalei ka inoa oia mau wahi ahupuaa, a noho iho la o Umi a Liloa ma ua wahila, he nui na kanaka, a he nui no hoi ka wahine maka hanoahano, a mau kaikamahine makua oia wahi, a he poe kanaka ui wale no, a o Umi a Liloa aku no ka oi o lakou i ka oi o ka ui a me ke kanaka maikai, a nolaila ua loaa papalua, a papaha ka wahine ia Umi, a i na keiki hookama, ua loaa ia lakou na wahine. I ko lakou noho ana ilaila, ua olelo aku na keiki hookama ia Umi a Liloa, "E noho malie no oe o makou no ke mahiai, a ke kahu imu nana wahine a me na makuahonowai o kakou, e noho malie no oe." Therefore, ʻUmi-a-līloa fled with his adopted sons, because of ʻUmi's fear of being killed by Hakau. That is why ʻUmi them sought protection, fleeing to the forest in the uplands of Hāmākua, else they be captured while traveling along the trail. Puaʻahuku is where they fled to first and entered into the forest point. It was Piʻimaiwaʻa's skill in catching birds of the forest that allowed them to obtain their "fish" and food until they arrived in the uplands of Laumaiʻa Kemilia, Laumaiʻa Kenahae. They stayed there and ʻUmi sent Piʻimaiwaʻa to go to tell Akahiakuleana that the place they were staying was in the uplands of Humuʻula, and that they could not return to live with the parents of ʻUmi-a-līloa. Akahiakuleana told him that it was not good for them to return to stay with them because the scouts of Hakau had arrived there. Akahiakuleana further said, "It is not good to stay within the boundaries of Hāmākua. You must go within the boundaries of Hilo, because the district of Hilo remains independent under Kulukuluʻā. Hakau has no mana, no power, in Hilo." When ʻUmi and the others had heard these words of Piʻimaiwaʻa from his mother, they went to live within the boundaries of Hilo, nearby the boundary of Hāmākua. Nā Waipunalei was the name of these ahupuaʻa, and this is where ʻUmi and the others stayed. There were many people there. There were many women of magnificent appearance, and many well-developed women of that place. They indeed were a beautiful group of people, and ʻUmi-a-līloa was the most handsome of them all in appearance and physique. Therefore, the women of ʻUmi were twice, and four times as many in numbers as others. And so too for his adopted sons. They were taken by women as well. While they stayed there, his adopted sons said to ʻUmi-a-līloa, "You stay and rest here. We are the ones who will farm, and our wahine and their parents will tend to the imu. You stay and rest." ʻUmi-a-līloa's journey from Waipiʻo to Laumaiʻa and Waipunalei, Hilo, Hawaiʻi. Maikaʻi Waipiʻo, he alo lua i nā pali. The sacred valley of Waipiʻo, chiefly home of Līloa. E nā hoa heluhelu o ke ala ʻūlili, eia nō kākou ke uhai aku nei i nā meheu kupuna ma ke ala o ko kākou aliʻi nui kaulana o Hāmākua nei ʻo ʻUmialīloa. E haele pū kākou a e ʻike ana paha kākou i nā hana kūpono o ko ʻUmi wā ʻōpio, ʻo ia nō nā hana i paʻa ai ke kahua o ko ʻUmi noho mōʻī ʻana. He waiwai kēia moʻolelo no kākou, ka lāhui aloha, i mea e ʻike ai i nā hana e paʻa ai ke kahua o ke aupuni pono. No laila, e nā makamaka, e hoʻomau kākou i kēia moʻolelo a Keliikaapuni i hoopuka mua ai, a e uhai pū kākou i ke aliʻi lokomaikaʻi o Hāmākua, ʻo ʻUmialīloa! Oh reading companions of the ala ʻūlili, here we are following in our ancestral footsteps along the trail of our famous aliʻi nui of Hāmākua, ʻUmialīloa. Let us go forth together, and perhaps we shall come to know the righteous deeds of ʻUmi during the time of his youth, which solidified the foundation of ʻUmi's reign as mōʻī. This moʻolelo is of great value to us, the beloved lāhui, as a means of learning the works that make firm the foundation of a pono government. Therefore, dear friends, let us continue on in this moʻolelo that Keliikaapuni first published, and let us follow the generous aliʻi of Hāmākua, ʻUmialīloa! Continue Reading the Next Installment! And if you missed reading Helu 1 (Chapter 1), you can read it here! If you missed the previous installment of "He Moʻolelo no ʻUmi," you can read it here! Alaila, haawi mai la o Liloa i kona malo, a me kona niho palaoa, a me ka laau palau me ka i aku, " Eia ka hoailona o ka kaua keiki, a me kona wa e nui ai, e haawi aku oe i keia mau mea nona." Alaila, ae o Akahiakuleana, i ka Liloa kauoha, a haawi ae la o Akahiakuleana na kana kauwa wahine e malama i keia mau hoailona a Liloa i haawi aku ai no ua keiki la. Alaila, hele aku o Liloa a hipuupuu i ka lauki i malo nona iho, a hume o Liloa i ka malo lauki. ʻUmi agreed to the advice of his mother, and Akahiakuleana commanded ʻŌmaʻokāmau to go along with ʻUmi. Akahiakuleana gave Līloa's lāʻau pālau (war club) to ʻŌmaʻokāmau, and told him, "Protect the club of Līloa."